Louisa starring in The Little Shop Of Horrors. A Clevedon student has been chosen to star in a hit musical production in Bristol next week. Louisa Pass, aged 17, beat hundreds of students from the Bristol area to be selected to play Mabel in the upcoming one off production of Fame The Musical at the Hippodrome on August 27. Louisa, who is studying A-level English and drama at Clevedon School, began her acting and singing career when she was just eight years old and has held leading roles in Annie, The Jungle Book and Bugsy Malone among others. 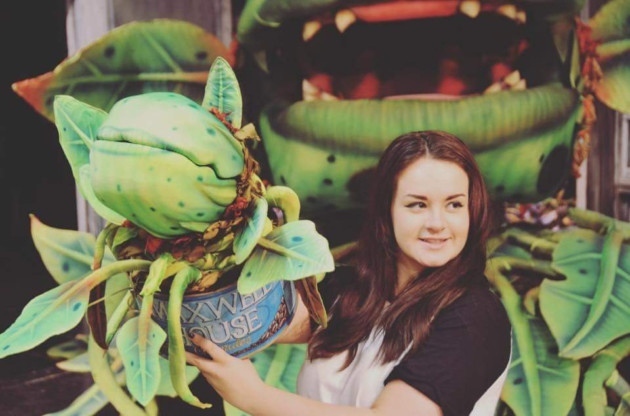 She has also been part of Clevedon School’s productions for the past six years, including last year’s impressive performance of The Little Shop Of Horrors. Louisa said: “The auditions were some of the toughest I have faced so far. “I am really excited to be performing on such a prestigious stage this summer and am looking forward to displaying my talents to the Bristol audience. She applied for the role through the first ever Stage Experience scheme, a charity which gives people the opportunity to perform regardless of their age or background. Louisa will take part in a week-long rehearsal camp from Monday to Saturday before taking to the stage for the big performance. She is also set to perform at the Clevedon Tides Festival in September and will also co-direct Clevedon School’s show at Christmas, before going on to study drama at university.